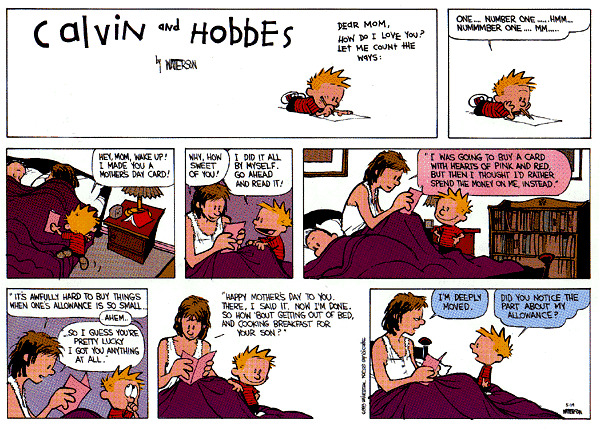 OK, there is nothing here related to Mother's Day (except for maybe this Calvin and Hobbes classic or these psycho movie moms), but here's wishing all you moms out there a great day of well-deserved spoiling. For Airport Security, Size Matters. Yet another reason to get an Android phone: Google Goggles gets an upgrade to translate real-world text. ClearOS (formally ClarkConnect) looks like a great replacement for Windows Small Business Server. What Conan was really thinking during his 60 Minutes interview. Speaking of Conan, he paid a visit to Google. Speaking of Google, they've added an app gallery for Analytics. Speaking of Analytics...well, I've got nothing. But speaking of Google, did you notice they flattened their logo? When 4Chan Gamed the Time 100. How to hide your collection of risqué material. Weirdest thing I've ever seen: These guys can run for short distances on water. The Queen may get last word in UK election. 21 Essential Social Media Resources. If the original Super Mario Bros was designed in 2010. How To: Jailbreak any iPhone, iPod Touch or iPad..
5 Best Personal Landing Pages.